If you are searching for air cooling vs liquid cooling then you know what one of your computer’s biggest enemies is. Heat can kill your computer’s insides as quick as a snap of a finger if you’re not careful. That’s why it’s important to have a good cooling system for your CPU, in order to prevent overheating your precious investment. Maybe you’ve been using air cooling for years now and think it’s the best kind of cooling there is. Or perhaps you saw an ad or article about liquid cooling and now you’re interested. Maybe you’re even thinking of switching to liquid cooling. 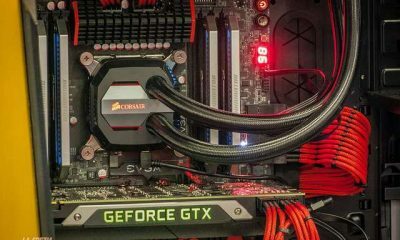 Whatever your reason may be, one thing’s for sure: you want to know about air cooling vs. liquid cooling and what makes one better (or worse!) than the other. In this article, we’ll tell you everything you need to know about these two types of CPU cooling, and what you need to know before deciding on the perfect one for your system. You want to keep your CPU always cool and chill, and for years, the best way to do this was through air cooling. In an air-cooled system, fans work hard in order to ensure that everything is kept cool at all times. These fans surround your CPU’s components and are very powerful, with an internal fan that does the cooling and an external fan that pushes out the hot air, effectively cooling everything down when things get hot. Meanwhile, liquid coolers use– you guessed it– liquid in order to cool your system. There are two types: closed loop and open loop, though their only difference is their customizable aspects (plus open loops systems require more maintenance). Since water is good at dissipating heat, water coolers are very good at keeping your system cool and comfy regardless of how much work you put it through. Now, it seems like both of these coolers do their job pretty well. So what’s the issue? Well, there are still a few things that you need to be aware of when you’re trying to decide between the two. The first thing you have to know about air cooling when you’re comparing it with liquid cooling is this: air cooling is extremely cheap. Sure, good liquid CPU coolers don’t have to cost you an arm and a leg, but they’re still relatively more expensive than dirt cheap air coolers. You can get really good ones for not more than $100. Plus, did you know that you can get air coolers for less than $40? If you have to stick to a budget, it’s easier to do that with an air cooler rather than a liquid cooler. While (open loop) liquid coolers usually need a more complex setup, all it takes to install air coolers is to attach the actual fans needed for your rig. It’s not that hard to plug in some screws to firmly place the fans, too. Remember, air cooling makes use of fans to cool your system. The thing is, we’re not just talking about a fan or two. We’re talking about a half dozen or so fans, all working together to prevent each individual component from overheating. The larger the fans, the larger the container that has to contain them. It’s no wonder that a lot of air coolers for higher-level systems take up a huge amount of space. To add to this, some air coolers can even ruin your other components after a couple of years, since they’re so big and heavy that everything else can bend and break under their weight. Liquid CPU coolers are much better at cooling down your CPU than air coolers. As we’ve already mentioned above, water dissipates heat well, making it better at preventing overheat than your typical air cooler. If you’re someone who occasionally overclocks your GPU/CPU, a water cooler may be your best bet at minimizing overheating risks. Unlike air coolers, liquid coolers have no noisy fans that can bother you or anyone else in the room with you. Their fans don’t usually have to work as hard as air coolers’ since the water does all the work, so you’ll barely even notice that it’s there. Liquid cooling is already proven to be safe, however there are still some risky aspects to keeping this kind of system. For one, you have to check regularly for leaks to avoid sparks that can potentially damage your components. Water and computer parts still don’t mix very well, so you have to be a lot more careful with this kind of system. Liquid coolers can be very high-maintenance, and they require regular cleaning unlike air coolers don’t need much maintenance. For example, air coolers only need to be checked every few months, and usually you only have to check the fans and the radiators. Meanwhile, water coolers have a lot other components to check and maintain in order to ensure that everything’s working in tip-top shape. So what’s the best choice? Air coolers or water coolers? To be frank, it depends. If you’re prioritizing your budget over everything, an air cooler is perfect for you. This is also the case if you don’t want to deal with water leaks and high-maintenance systems. If you’re willing to sacrifice a few more dollars for a smaller, quieter system, the liquid CPU cooler is your answer. Whatever it is though, we hope you’re happy with your choice!